Watch Daney Coleman unveil his star on the Walk of Fame below. 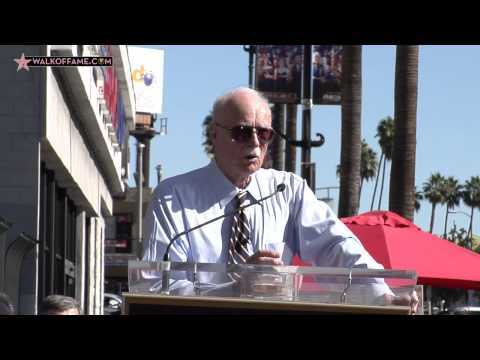 The Hollywood Chamber of Commerce proudly honored actor Dabney Coleman with the 2,533rd star on the Hollywood Walk of Fame on Thursday, November 6, 2014 at 11:30 a.m. PST. The star in the category of Television was unveiled at 6141 Hollywood Boulevard in front of the newly developed Eastown. Along with friends and family, actress Penelope Ann Miller was on hand for the festivities. Dabney Coleman was born in Austin, Texas in 1932 and was raised in Corpus Christi. He attended both the Virginia Military Institute and the University Of Texas School Of Law before deciding on a career in acting. He also served in the military, with the US Army, Special Service Division. Film, stage, and television actor Dabney Coleman has most recently been seen as ‘Commodore Kaestner’ in the Martin Scorsese directed and produced series “Boardwalk Empire” for HBO, for which he won two SAG Awards for Outstanding Performance by an Ensemble in a Drama Series. He was also recently seen in “Char·ac·ter” a documentary on six illuminating filmmakers and friends. A documentary is currently in the works title “The Dabney Coleman Documentary” and will be released in 2015. Coleman’s despicable, egotistical, insecure ‘Bill Bittinger’ on “Buffalo Bill” earned him a Golden Globe nomination and two Emmy Award nominations. As an unsavory sportswriter in “The ‘Slap’ Maxwell Story,” Coleman received an Emmy Award nomination and won a Golden Globe Award. He then starred in and was an executive consultant of “Drexell’s Class.” In 1994, Coleman starred in “Madman of the People” as an opinionated magazine columnist who frequently clashes with his publisher-daughter. Much of Coleman’s earlier television work was in comedy yet his roles were equally rich in drama. He was nominated for a Golden Globeand won an Emmy for his dramatic performance in the television movie “Sworn to Silence” opposite Liam Neeson and Peter Coyote. He received an Emmy nomination for the miniseries “Baby M,” one of the first shows to deal with surrogate mothers, and got another Emmy nomination for Outstanding Guest Actor in a Drama Series for a role in “Columbo.” He was nominated for a CableAce Award for his performance in the HBO television special “Murrow.” In 2001, he began a three-season run on “The Guardian” alongside Simon Baker. Most recently he was seen in an episode of “Law & Order: SVU” as a con struggling with Alzheimer’s disease. Coleman has been in countless comedy and dramatic series as well as many Movies-of-the-Week including “The Texan,” “Kiss My Act,” “My Date with the President’s Daughter,” “Kidnapped: In the Line of Duty,” “Must Be Santa,” “Guilty of Innocence: The Lenell Geter Story,” and TNT’s “Never Forget.” He recently played Jenna Elfman’s irascible father in “Courting Alex,” and in TNT’s “Heartland” where he re-teamed with “The Guardian” creator David Hollander. Coleman is involved in several such charities as: The Christian Children’s Fund, The American Society for the Prevention of Cruelty to Animals, and the Wounded Warrior Project.